A cloud of gas 300,000 light-years long is arching around the Milky Way, shunted away from two dwarf galaxies orbiting our own. 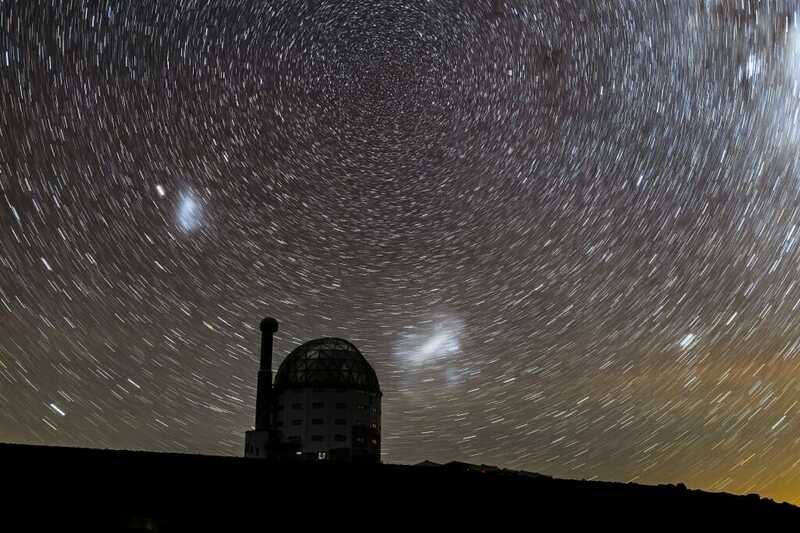 For decades, astronomers have wanted to know which of the two galaxies, the Large and Small Magellanic Clouds, is the source of the gas that has been expelled as the two galaxies gravitationally pull at one another. The answer will help astronomers understand how galaxies, including the Milky Way, form and change over time. With colleagues at the Space Telescope Science Institute and other institutions, astronomers at the University of Wisconsin–Madison used the Hubble Space Telescope to analyze the stream of gas. 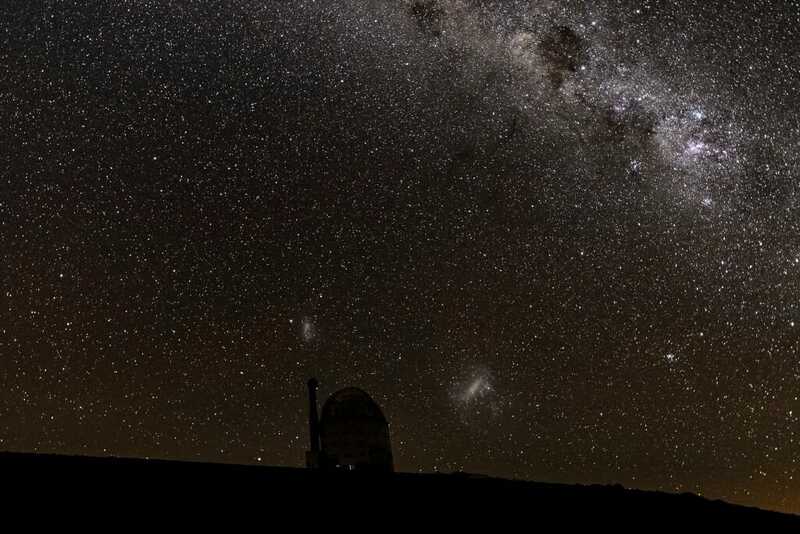 By identifying the chemical makeup of the gas, known as the Leading Arm of the Magellanic Stream, the researchers identified one branch as coming from the Small Magellanic Cloud. The results show that the Large Magellanic Cloud is winning a gravitational tug of war with its smaller partner and will help refine models of the complex orbit controlling the dwarf galaxies’ motion. Visible with the naked eye from the Southern Hemisphere, the Magellanic Clouds appear as fuzzy offshoots of the Milky Way, which they orbit. 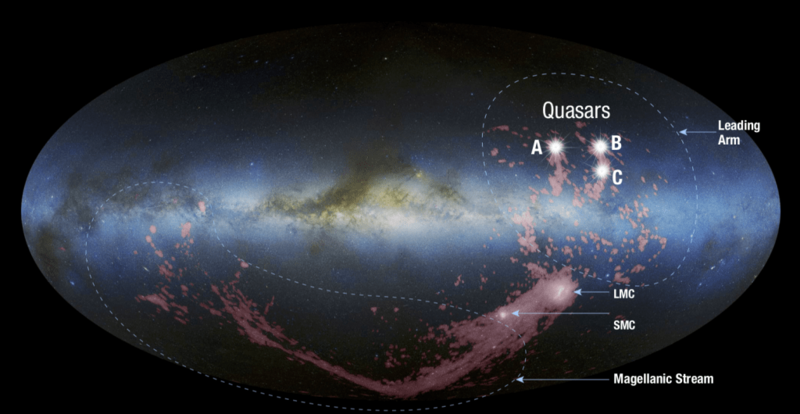 In the 1970s, they were identified as the source of an enormous stream of matter — the Magellanic Stream, which includes the Leading Arm — that could be seen encircling the disk of the Milky Way. After its discovery, Blair Savage, an emeritus professor of astronomy at UW–Madison, worked for decades to understand the gas complexes around the Milky Way, including the Magellanic Stream. He recruited several young researchers to tackle the problem during their training at UW–Madison. Six of Savage’s previous mentees, many of whom have since moved to other institutions, are co-authors of the new report. “He’s really the core reason that this all happened in Wisconsin,” says Bart Wakker, a senior scientist in the UW–Madison astronomy department who came to Madison to study the interstellar and intergalactic medium with Savage in the 1990s. To get at the chemical composition of the Leading Arm, the researchers identified four quasars — ultra-bright galactic centers — that lie behind the stream of gas. With the Hubble Space Telescope, they then collected ultraviolet light from the quasars as it filtered through the Leading Arm. The team combined the ultraviolet light data with measurements of hydrogen using radio data, which showed an abundance of oxygen and sulfur characteristic of the Small, rather than the Large, Magellanic Cloud. That similarity in chemical makeup is evidence that the Leading Arm was gravitationally ripped from the Small Magellanic Cloud, likely more than a billion years ago. Previous results appeared to show that the Leading Arm comes from the Large Magellanic Cloud, which suggests that galaxy-sized stream of gas may have complicated origins. The researchers note that the new work leaves open questions about the fates of the dwarf galaxies and the matter they throw off. This work was supported in part by the National Aeronautics and Space Administration through grants from the Space Telescope Science Institute.